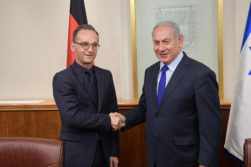 Germany is one of the top six most powerful nations in the world in the diplomatic arena, and should Israel need to launch military strikes in Gaza, they may need political support on the global stage. The same day as Netanyahu’s warning, thousands of Gazans rioted against Israel and worse. “A mob of approx 20K Gazans are burning tires, throwing bombs and grenades, and attempting to break through the border fence with Israel, which 10 armed terrorists did, until we stopped them. In response, an IDF aircraft carried out two strikes in Gaza,” the IDF Spokesperson posted to Twitter last Friday. Netanyahu, whose comments were published by his office, also highlighted that Palestinian Authority President Mahmoud Abbas is making things worse for the Gazans. Netanyahu went on to say that Abbas has even “interfered in all UN attempts to ease the plight in Gaza,” leading to international condemnation.